The UK lunch culture being what it is, microwaveable ready meals and snacks are a big thing, and most companies have a microwave and a toaster. While that works well for store-bought ready meal curries or bread, the package of onion bhajis asks for ten minutes in the oven so they come out crispy. However, there's no oven available. If I pop them in the microwave, they will be thoroughly heated and safe to eat, but really soft and squishy. If I stick them in the toaster, where I can fit two on each side, they'll be really hard to get out and make the toaster greasy. I tried laying the toaster on the side to turn it more into a grill, but given the state of the toaster, that created a lot of smoke from bread crumbs inside it now resting on the lower heating units, so that's no good because of its safety implications. How can I reheat those fritters to get them at least a little bit crispy on the outside without an oven or pan? 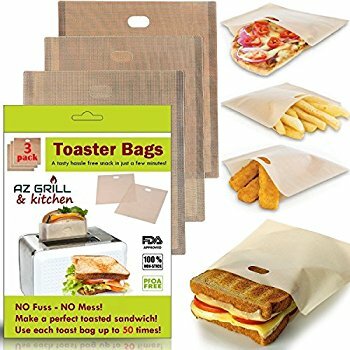 If the bhajis fit into the toaster slots, toaster bags should work. They are primarily intended for toasted sandwiches, but it they can contain melted cheese good I wouldn’t expect a bit of bhaji grease to be a problem. They should work for samosas too. Most supermarkets sell them, there are lots of brands available on the High Street or online. You could try a microwave browning, or crisping, dish (I'm just trying to give you search terms here). It will absorb microwave energy, and become hot enough to crisp your Bhaji some way, if you give it a turn, and while you're at it, pop the door open to let the steam out. Warn anybody sharing the kitchen about it though, just in case they grab it without thinking, and make a dry tea-towel or oven-glove available, so you can handle it. Not the answer you're looking for? Browse other questions tagged microwave indian-cuisine reheating toaster or ask your own question.